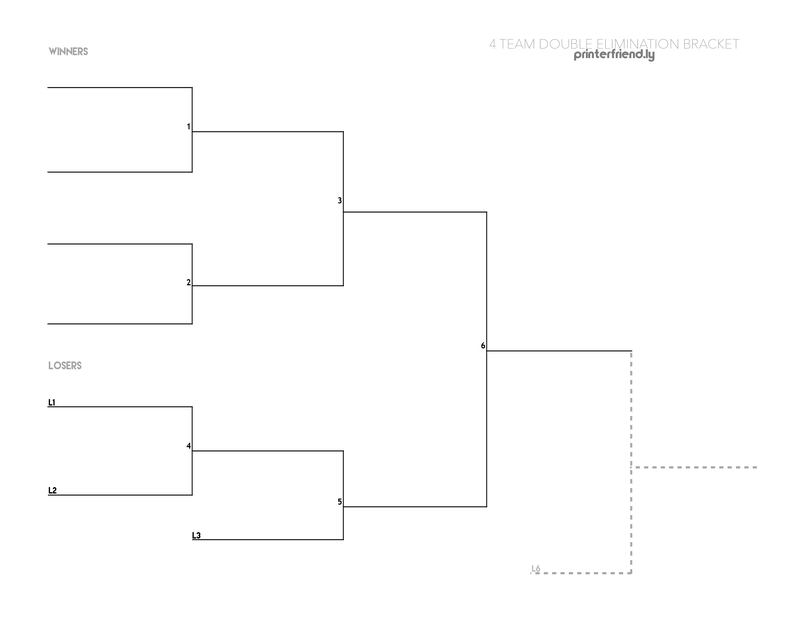 Have a Double-Elimination tournament coming up and need a printable bracket? We’ve got you covered. Whether you’re organizing your own tournament, playing in the tournament itself, or are an awesomely supportive parent or friend following a team, Double Elimination tournaments can be a bit tricky to follow. The right bracket will make keeping track of the field a whole lot easier. What is a 4-Team Double-Elimination Bracket? Tournament brackets vary in size based on the amount of teams participating. A double elimination tournament has two categories to keep track of, the “winners” bracket and the “losers” bracket. Each bracket (winners and losers) will run the same way a single elimination tournament would. The main difference is that the losing team from the winners section drops down to the “losers” section, wherein the final match, the prevailing two teams from each section will match up for the championship title. A 4 team bracket works out evenly. For four competing teams, there are an even number of winning teams advancing to each round. Our double-elimination, four team downloadable brackets comes in a variety of options! You can download and print them out in PDF, full-size image or in Excel. With our brackets, they’re not limited to just basketball or baseball tournaments. As long as the tournament is double-elimination then our printable, blank brackets will work with any tournament. For single elimination tournaments with four teams, click here.